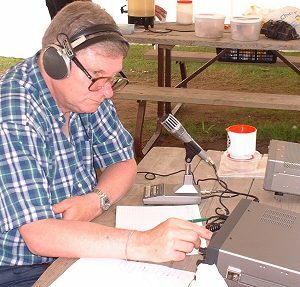 Once again KWARC operated Field Day from the Pioneer Village at Doon Heritage Crossroads. With tremendous co-operation from Wendy Connell of the village, each year Communication is the weekend theme. This year with KWARC celebrating our 80th anniversary we expanded on this with a large display of historical radios from the early 1900s up to the current state of the art equipment. Full details on this display can be reviewed at this link. 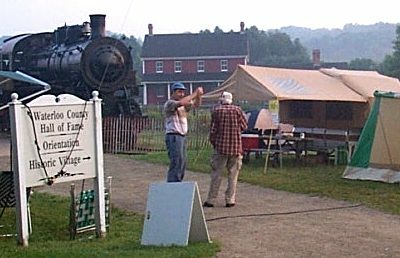 Dave VE3RBA (l) telling Don VE3ESE(r) "Strongly suggest you move the tent off the track Don"
For as long as most of can remember, Eileen and Hubbie Stumpf have been serving up chilli and home made strawberry tarts to the field day crew. 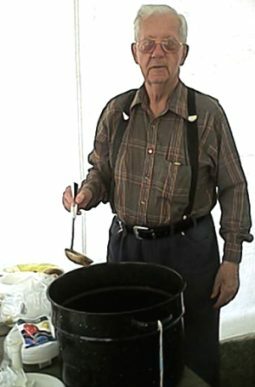 Eileen and Hubbie believe this is there 15th year that they have been serving up the traditional dish. 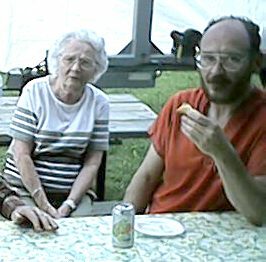 That's Gord VE3EOS sitting with Eileen as he enjoys one of Eileen's strawberry tarts. A most sincere thank you to Eileen and Hubbie. 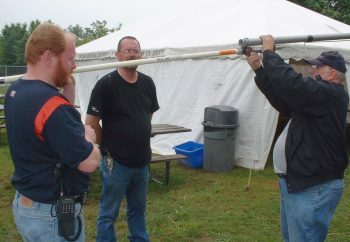 The raising of the field day tower as Terry VE3NSV (l), Terry VE3NEJ (supervising) and John VE3SJV tightens a few bolts. 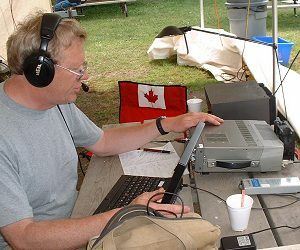 Fred VE3OQB on the air with the 40 metre SSB station. As usual 40 phone had the most Qs however with each CW contact worth 2 phone contacts who knows who had top score. 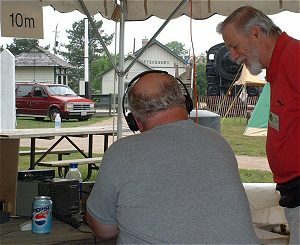 Norm VE3DEQ (standing) looks on as John VE3SJV works the 10m SSB station. 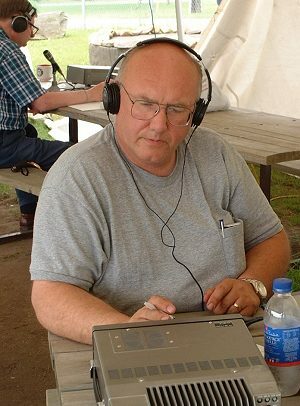 Thanks to Ben VA3BNY KWARC field day is blessed with the use of the 60 foot crank up portable tower that Ben owns. This trailer mounted tower can be erected in about 30 minutes and serves as the end support for all dipoles and the 6 metre yagi. This tower has been used in several ARES exercises including the Y2K event when it was used as backup at the Waterloo Regional PD HQ. John VE3SJV operating 10m SSB with Bob VE3XM on 75 SSB in the background. Thanks to the villages program Director Wendy Connell for her great support. 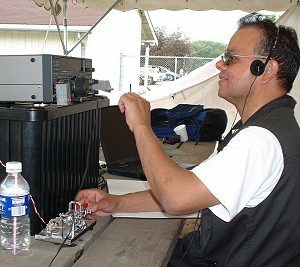 Bob VE3XM helping out on 75 phone. Daytime conditions where terrible but Doug Smith VE3IYB with some Sunday help from Bob were still able to pile up an excellent score. KWARC also provided a History of Radio display as part of our 80th Birthday. CLICK HERE for details.